Legislators in Idaho are holding hearings today to determine the fate of a tough new bill which could have animal activists facing jail time if they carry out hidden camera investigations on farms. Citing undercover footage taken at a dairy farm that aired last year on ABC News "Nightline" – which showed horrific abuse of cows – Idaho legislators have highlighted an issue that has heated up in recent years, pitting animal-rights groups against American farmers and raising the debate on First Amendment rights. "It's true, it has put us against each other," Idaho Senator Jim Patrick, the bill's sponsor, told ABC News. "There are groups that without due process of law, take the videos across the country and intend to destroy the business." Patrick says famers don't condone animal abuse but felt the need to protect their private property against being "set up" by rights groups. "These are all family farms here," he said. "We just think it's wrong." If passed, the measure would put anyone caught surreptitiously recording video inside an agriculture operation in jail for a year. There is also a $5000 fine. In the case of the Idaho farm being cited in the debate, an activist working undercover for the group Mercy for Animals recorded brutal abuse of cows at Bettencourt Dairies in 2012, including beating and shocking them. The video was turned over to local law enforcement and criminal charges were brought against three employees. One pleaded guilty to misdemeanor animal cruelty. The Bettencourt case and the issue of legislation intended to thwart the efforts of animal-rights groups were featured in a "Nightline" investigation and on "World News with David Muir" last year. Luis Bettencourt told ABC News' Brian Ross in 2013 that threats were made against him and his family after Mercy For Animals released the undercover video. "They turned it around on [Bettencourt] and turned social media against him and then went after his market," said Bob Naerebout of the Idaho Dairymen's Association. "It went way beyond what they say was their agenda." Mercy For Animals calls the proposed Idaho legislation a "blatant violation of free speech" and a "desperate attempt to sweep evidence of animal cruelty under the rug." "This ag-gag bill sends a clear message: Idaho's dairy industry has a lot to hide," Nathan Runkle, the group's founder, told ABC News. "They know that their hideously cruel practices can't stand the light of day or the heat of public scrutiny." It's the latest in what has become a contentious, personal battle between farmers and animal activists. While the agriculture industry has called animal welfare groups "terrorists" who trespass in an attempt to ruin American farms, the groups, including The Humane Society of the United States, say these investigations have resulted in countless law enforcement actions over the years. Activists say the videos have also brought to light widespread food safety concerns. 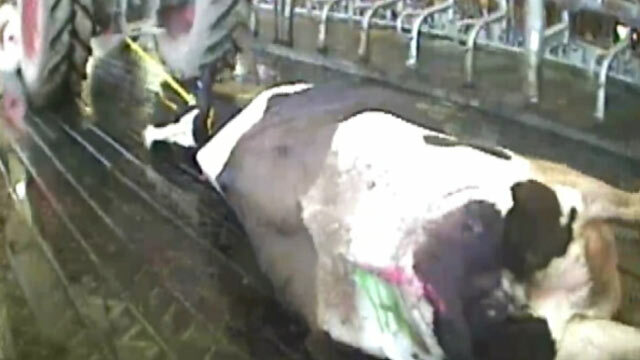 In 2008, undercover video recorded by HSUS at a Chino, California slaughterhouse revealed how diseased, or "downer," cows were being used for beef sold to consumers in grocery stores. That investigation led to the country's largest-ever meat recall and a state law banning the use of such downed cattle. Just last week, workers at a Wisconsin dairy farm in the supply chain for DiGiorno's Pizza were changed with 11 counts of criminal animal cruelty, following the release of undercover video by Mercy For Animals depicting brutal treatment of cows. Patrick says the bill in Idaho is meant to also strengthen animal cruelty laws in the state. But, he adds, farmers are also concerned about food safety issues when activists gain access to their facilities. "The Department of Homeland Security has said some of these groups are equal to Al Qaeda. We want to make sure our food security is not at risk," he said. The fight against so-called ag-gag legislation has gained both publicity and momentum recently. 11 states introduced legislation last year alone, and activists called 2013 a tipping point in what they deemed a full-scale assault on their most powerful investigative tool. In the end, not a single bill passed. Four states, including Idaho, have already considered some form of "ag-gag" legislation in 2014; lawmakers in Arizona, New Hampshire and Indiana also introduced bills this year. There are laws on the books in six states, including Iowa, where it is a crime to get hired at a farm under false pretenses. That law passed in 2012, just a few months after an ABC News report that featured undercover video showing inhumane and unsanitary conditions at a large egg factory. Undercover activists have vowed to continue reporting on conditions inside American farms, despite the push to keep them out. The activist who documented the abuse of cows at Bettencourt Dairies told ABC News last year the public needs these videos more than ever. "Most members of the public don't understand what we're doing. They think we're just running around filming things and throwing it up on YouTube," he said. "These are criminal investigations." The Idaho bill is expected to be voted on in the House next week. Naerebout says the farming community is anxious for change. "We cannot continue to have that exposure without protection."